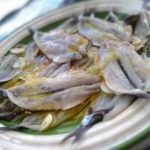 Marinated anchovies: The marinated anchovies – an Italian antipasto that you find served along the coastlines of Italy, are very different from those salty offerings that you find squeezed into small jars and made available in the supermarkets all over the world. The experience of those salty anchovies has put some people off trying the real thing. 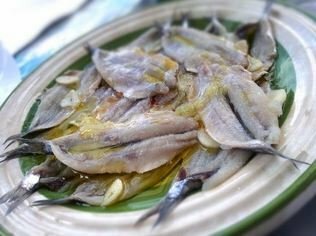 Freshly prepared anchovies in oil are served as an appetizer here on the little Italian island of Ponza and are reasonably easy to prepare. Once you have prepared fresh anchovies in oil they will keep for a number of days in the fridge and you may never buy another supermarket jar of them again! First clean the anchovies: remove the head, open the belly of each fish, discard the inners then spread the fish open to make it flat and pull the spine to remove it along with any other bones that you find. Rinse them under water and pat dry. First marinate the anchovies in the vinegar for 2 hours then remove them and pat each one as dry as you can. Combine the lemon juice, garlic, oil and parsley. Add a single layer of anchovies in a shallow dish and pour over some marinade. Continue to layer in this way and ensure that the anchovies are completely covered in the marinade. 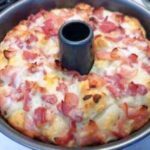 Cover and place at the bottom of your fridge for 5 – 8 hours before serving.